Deionized Water, Aloe barbadensis leaf juice, Niacinamide, Hamamelis virginiana, Kosher vegetable glycerin, Propylene glycol, Carbomer, TEA, Methyl/Propyl paraben. Warning: For external use only. Do not take this product by mouth. STORE IN A COOL, DRY PLACE. Suggested Use: SHAKE WELL BEFORE USING. Apply a small amount to affected areas twice daily or as directed by a health care professional. Metazene — There’s no reason for anyone to suffer from acne. It improves the skin’s water barrier function, which is impaired in acne-prone skin. Extracts of Hamamelis virginiana have strong anti-inflammatory actions which appear to work synergistically with niacinamide and aloe to produce a large effect. Aloe, a gelatinous substance from the plant ‘Aloe vera’, is a traditional herbal remedy used mainly for skin ailments. It stimulates the growth and repair of the skin at the sites of acne lesions (pimples). Aloe also has anti-inflammatory properties that add to those of niacinamide and Hamamelis. This is the formula that deals with the root causes of acne and does so without side effects. Users have been amazed at the great results they have seen with this product. Accordingly, we will limit our discussion of Metazene to a brief summary of relevant research, and let you draw your own conclusions about what medical conditions it may be effective in treating. Until a few decades ago acne was difficult to treat effectively. The causes were not understood and treatments were based more on false premises and wishful thinking than on evidence of success. For example, it was widely believed that acne sufferers caused their condition through slipshod bathing habits or by sexual activities. These and other myths about acne are still being circulated and result in many sufferers not getting treated. One of the myths about acne is that it is a ‘merely’ cosmetic ailment that isn’t worth treating since it isn’t life-threatening and will go away eventually by itself. This is the attitude taken by cheapskate parents who don’t want to spend money on their offspring. The truth is that acne is a serious problem, both psychologically and physically.1 It need not be expensive to treat, and there is no good excuse for anyone in the 21st Century being victimized by it. Another myth is that acne can be treated by washing the face vigorously. While washing can help the skin in some ways, it is useless for preventing acne. Soap and water do not penetrate the skin to where the problem is located. Testosterone and similar hormones (which increase in both sexes during adolescence) cause oil glands in the skin’s pores and hair follicles to become enlarged and overactive. The channels through which this oil normally travels to the skin surface become clogged with proteins produced in the skin. Bacteria that normally live and multiply in this oil can no longer escape to the surface. They continue to reproduce in the clogged channels. Bacterial activity attracts cells of the immune system which flock to the acne sites and release substances that irritate and damage the skin. Retinoids make the skin dry, red, flakey, cracked, and painful, and they cause severe birth defects. Antibiotics work poorly, and have distressing side effects if used systemically. Bactericides also work poorly, are inconvenient, and can damage clothing. Steroids and inhibitors often have undesired side effects, and sometimes even damage the body permanently. Heat is not very effective. Light therapy is quite expensive and can cause burns. The seventh approach to treating acne, anti-inflammatories, has few if any negative side effects. Inexpensive anti-inflammatory products are readily available without a prescription. None of these anti-inflammatories are better than niacinamide and Hamamelis in their ability to suppress acne without side effects. After an acne lesion (pimple) is inactivated, the skin’s repair mechanisms come into play. Unfortunately, these work poorly — that’s why we see so many adults with faces scarred from acne episodes earlier in life. A good acne treatment should therefore include a substance that aids in skin regeneration. Aloe is such a substance. Let’s look at what is known about these substances as acne treatments. Niacinamide (aka ‘nicotinamide’) is a member of the vitamin B3 family. In the body it is converted to NAD, which plays an essential role in many biochemical reactions in all living organisms. Niacinamide has been a part of the biochemistry of life on Earth for more than a billion years. Because the mechanisms of action of niacinamide and Hamamelis involve different parts of the inflammatory process, these two substances can work together synergistically to produce a large effect. This would explain why Metazene, which uses the two substances in combination, has such a remarkable impact on acne in many people. 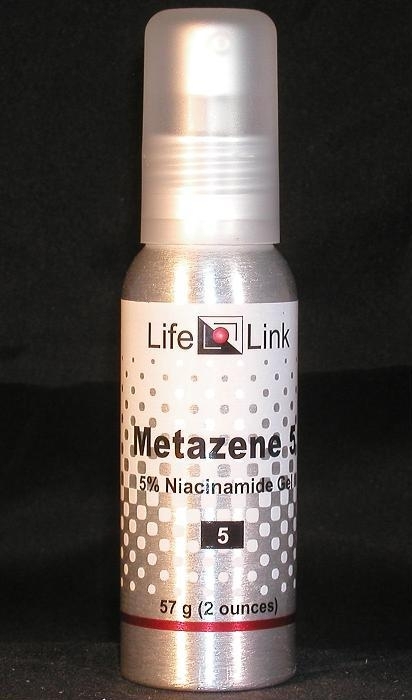 LifeLink has had queries from Metazene users who were astonished by its effectiveness, asking whether the product contains any ‘secret’ active ingredients not listed on the label. It doesn’t. There are just three active ingredients: niacinamide, Hamamelis extract, and aloe. They make a surprisingly powerful anti-acne combination. Is Metazene useful for the conditions and purposes mentioned above? We aren’t allowed to tell you, so you should take a look at some of the references cited here, and then decide for yourself.